The state's proposal to convert some paved roads back to gravel has invisible counterparts in other areas of the state budget. But it's apparently safer to talk about transportation problems. If you don’t like Texas, this gravel road idea should make you deliriously happy. 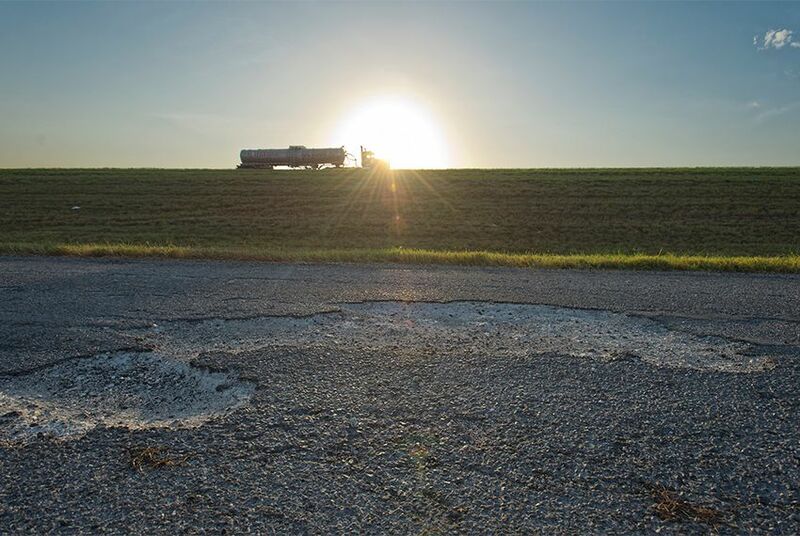 The state’s highway department is scratching around for money, and one of their stopgaps is to convert some paved state roads, damaged by truck activity related to the current drilling boom, back to gravel. Economic development types in New York, California, Missouri and Maryland — where Gov. Rick Perry has made very public overtures to companies that might be persuaded to move to Texas — ought to be carrying bags of gravel to their pitch meetings. And they should send thank-you notes to the Texas Department of Transportation. What a gift. The latest transportation idea in Texas illustrates the troubles of meeting the demands of growth and plain old wear and tear in a state where voters think government already costs too much. The people at TxDOT, like their counterparts in other state agencies, estimate how much money they need to do their work. They give the numbers to the budget writers, defend them in hearings and find out over the course of a legislative session how much money they will have over the next two years. Lawmakers are in a self-made box, stuck between the promises they and their predecessors have made about government programs and services and their own promises to hold the line on spending. Spoiler alert: They can’t afford to do the things they have promised to provide without crossing the voters in other ways — by raising taxes or fees or borrowing gobs of money. The road folks haul around an awesome talking point that probably would be unmentionable at any other state agency: It’s the cost of maintaining the current level of congestion in the state. The engineers and other number-crunchers are telling state officeholders that they can increase spending on roads or they can go home and tell their voters that traffic is going to get worse. The political message is a real mess: The candidates end up telling their voters that it will cost $4 billion to $5 billion a year just to keep traffic as tangled up as it is right now. No improvements ahead, but no backsliding, either. Unless, of course, the money isn’t available. Then you have to replace some of your pavement with cheaper road materials. Gravel, for instance. Transportation is not the state’s only underfinanced program, but it is in a unique position when talking about the consequences of its budget. Health and human services agencies don’t get to talk about how many more people will get sick or die if their financing is cut. It is somewhere between difficult and impossible to tie public school performance to state financing, if only because so many other variables muddle the numbers. Regulatory agencies don’t wave around projections on how many industrial plants won’t be inspected and what the consequences might be. You have to admire the honesty of the transportation people. This is what you spend, and that is what you get. Cut spending, cut expectations. Easy as pie. They seem to be in one of the rare areas of state government where the people involved are allowed to say right out loud what a budget decision will actually mean. Others have to say they will do more with less — a way of saying that they either didn’t need as much money to do the job as they first thought or that they hope the corners they cut to save money won’t cause anyone any trouble — or at least any trouble that will get noticed by voters and politicians. Roads have another characteristic not shared by most state services: They are visible, and we all use them. Most Texans are not involved with public schools on a daily basis, or with the health and human services safety net, or even with regulators or state police. But the roads are right there, every day, in all their glory, with potholes and construction projects and traffic jams growing worse as more people, and more cars, flow into Texas. That visibility makes a difference. Texas residents can see the quality of one of the government services they pay for. In some places, they’re finding gravel where there once was pavement. Other state programs have their equivalents of the gravel roads. They’re just not allowed to talk about it.